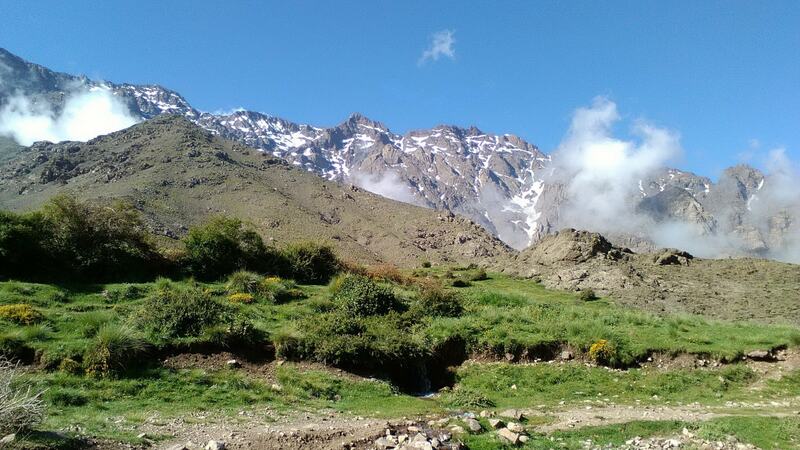 This 6 day trek includes 5 nights wild camping and a bid for Toubkal Summit. This trek starts in Imlil, you can arrive there the previous day if you wish or be collected early in the morning of the trek. All of the 5 nights will be in wild camps, our mule Team will take care of all of the preparations, cooking and camp management; you are welcome to help with setting up the tents if you wish. The best months for this adventure are from May till October when the nights are not so cold. You will see many Azibs on this trek - small stone shelters built by shepherds for the summer months when they move their flocks of sheep and goats to fertile pastures watered from the winters snow melt. This is the ideal trek to take you off the beaten path and through remote valleys, villages and mountain passes. Top it off at the end with a summit climb of North Africa´s highest peak; Mount Toubkal, sitting at 13,671 feet. After breakfast, we meet our mule team and set out on a two hour uphill hike to Tizi Tamatert. On the way we will see typical flat-roofed Berber villages surrounded by small terraced plots of land. We continue to climb gently until we reach the large village of Tacheddirt (2314m) where we stop for the night in tents outside the village. Approx. 5 hrs walking. We begin a long, slow ascent to the pass at Tizi Likemt at 3555m. The going is quite tough as there is a considerable amount of loose scree on the ground. At the top we enjoy our first panoramic view over the Toubkal massif with its Berber villages and valleys, before going down to Azib Likemt, where we camp for the night. 5 hours walk – 400m ascent. After breakfast, we begin our trek towards Azib Tifni along the small river or gorges of Tifni passing by several other Azib’s, lunch in one of the Azib’s or near the river. After an unforgettable morning sunrise from Azib Tifni over its beautiful gorge, we start our trek up to Tizi n´Tagharat, then a long descent on a mule track to reach the Marabout of Sidi Chamharouch, where we camp for the night. After enjoying breakfast, we will continue towards the refuge (3200 m). A glass of tasty mint tea will be served for you there. Hot shower will be available to wash off the dust from your body and freshen up for the next day. Dinner will be prepared and you will spend the night in tents. The next day starts with an early wake up to escape from the full power of the sun. Breakfast is served around 5 am. We will begin the ascent climb at 5:30 am. In the middle of our climb we will stop for a short break with some refreshments. After walking uphill for some 3-4 hours, we will be able to enjoy a picturesque view of all the High Atlas Mountains, valleys and Berber villages. Once at the summit, we will have a break of 45 minutes to take pictures and enjoy the magnificent view. Afterwards we will return back to the refuge, where the lunch will be waiting for us. We descend back to Imlil following the same route down to Sid Chamharouch, floodplains and Aremd, then down to Imlil for a welcome glass of mint tea, and where the transport will be waiting to take you to Marrakech.